Perhaps best known for the Imperial Easter Eggs created for the Russian Royal family, the House of Fabergé also fashioned jewelry and luxurious gifts for many ruling families of Europe as well as other wealthy patrons. 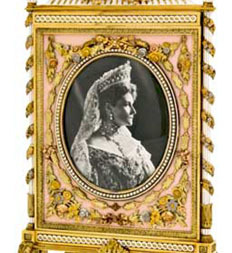 Visitors could marvel at exquisite objects produced by the Fabergé workshop at its peak, including personal gifts to the Tsar and Tsarina, an extravagant tiara, magnificent “fire-screen” picture frame, and the famed Nobel Ice Egg, a stunning piece that is one of the few Imperial-styled eggs in private hands. From elegantly simple to breathtakingly ornate, the jewelry, clocks, picture frames, boxes and eggs in this collection were thoughtfully selected to exemplify extraordinary materials and workmanship. In recent years, the McFerrin Collection has become one of the world’s most important private collections of Fabergé. While many of the pieces in this collection have been featured individually in other exhibitions and publications over the past 60 years, this event marked the first time that the McFerrin Collection had been presented for public display.